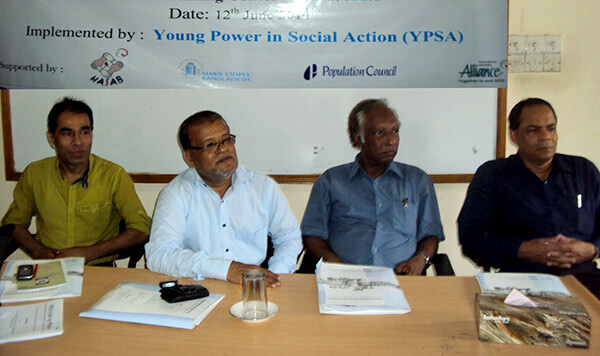 YPSA-Link Up project organized a local level advocacy meeting on “Better Sexual and Reproductive Health & Rights for Young People Affected by HIV in Bangladesh” on 12 June, 2014 at YPSA HRDC Campus, Chittagong. Dr. Md. Alauddin Mazumdar, Director, Department of Health, Chittagong, Dr. Sheikh Rokon Uddin Ahmed, Deputy Director, Department of Family Planning, Chittagong and Md. Mahabubur Rahman, Director (SD), YPSA were present in the meeting. Representatives from GOs, NGOs and Civil society organizations attended the meeting.